When you leave your job, what legacy will you leave behind? What will people remember about you? What will you recall as your lasting contributions? I think all of us, no matter what our title is, should strive to leave our position better than we found it in whatever way we can. It goes along with one Stephen Covey’s 7 Habits—“Begin with the End in Mind.” What began my thought process about career legacies and planning for your life after work beyond the financial sense was the death of the legendary Penn State football coach on Sunday morning. Joe Paterno earned five American Football Coaches Association awards, held the most records spent as a head coach at one school (46 seasons) and had the most victories for a major college coach by winning 409 games! Certainly during his tenure he certainly was a positive influence on the many lives he impacted. His legacy however has the cloud of the recent child sexual abuse scandal. Not because of anything he did physically to children—but more so for what he failed to do when he reported the abuse to “someone he thought would do something about it” instead of reporting it to law enforcement. Most of us do not have careers under media scrutiny—most of us will not have careers spanning 46 years with one employer; but we will all leave a legacy when we leave our jobs. And, every day at work we write a sentence of what we will be remembered for by our colleagues and in our own mind. I worked with a retiring administrative assistant who was remembered by her co-workers as the “Czar of Office Supplies” she counted and monitored the paper clips, pencils and file folders that everyone requested and she kept them in a locked file cabinet behind her desk. I’m sure, in her many years of service; she had many other contributions to the company. At her cake and punch reception on her final day at the office person after person commented on the woman’s diligence in monitoring office supply expenses. Maybe in her role she felt it was the only thing in her span of control. I urge you to think more broadly. Even if you don’t get the public accolades for it when you leave, you will know inside that you left your workplace just a little better because you worked there. I remember my grandfather who worked his way up from a sharecropper as a young child, through a meat-packing plant as a young adult to a crane operator in a steel mill in Gary, Indiana. He told me about the dangerous conditions with glowing hot steel bars radiating heat when men walked into the plant. Above everyone, was the crane operator deftly moving tons of hot steel sitting coolly above the work floor in a position considered too skilled for the Black workers who toiled more closely to the extreme heat. From the moment he saw the crane, he said he was mesmerized and knew he wanted to show management a Black man could do that job. 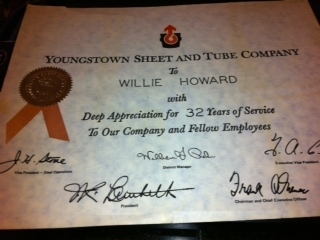 His legacy after 32 years of service was working his way off the floor of Youngstown Sheet & Tube, a company now long gone, to become the lead crane operator and to mentor others that would follow him after his retirement. Have you thought about the impact you will leave on your workplace as a boss or mentor, as a co-worker, as a subject matter expert in your field or as a corporate volunteer? Share it with here and join the conversation. Another fine post, Brenda. Thanks for encouraging us to see ourselves as contributing even when we don't feel like we're making the progress we could or should. I found the story of your grandfather inspiring. I for one don't really care what people think after I stop working with them. I try to do the right things by people. I can spend time trying to worry about what they'll say but what good will that do? People going to say or think whatever they want. This is something I am very conscious about in my career and I have been very aware of this over the course of my life since school. As a school aged child I'm not sure that I was as concerned with my 'legacy' per se, but I did realize that behavior, particularly 'good' goes a long way. I was astounded several times when the meanest or most impolite teachers or administrators would go to my Mom at school functions and sing my praises. But who you are, consistently, is what you are remembered for. The same is true now. As I deal with difficult people on projects and in life, I try to stay focused on being positive and making a difference. I find that having a deliberate focus on your legacy not only leaves a lasting legacy but gains you credibility. This credibility is what launches you to the next great thing. I agree with BrownGirl that early in my career I adopted integrity as a way of always doing business. Not everyone around me did the same thing. I was in timeshare sales for 12 years and I saw people say and do anything for the sale. I just wouldn't do that. I was honest and I made my quota and had a good career. Then I moved to Oklahoma and for into wholesale distribution and I again saw a lot of shady unethical things going on around me. I am glad I choose to be honest and ethical in my business dealings. I can sleep at night knowing I tried to do the right thing. If that is a legacy then that is mine. It is really a motivating article; I appreciate your sharing Brenda. Recently I enter in my career life after completion graduation.